Real Estator Lite: An Awesome Free WordPress Real Estate Theme! Real Estator Lite: An Awesome Free WordPress Real Estate Theme! There is no denying that each and every sector of business has competitions now more than ever. Additionally, with all the advanced technology developed over the years, even the digital market now is a cut-throat contest to come up with new ideas. And to stand out from the rest and be more appealing to your customers and clients is the number one priority of all the business niche. That’s right! Alongside the services you provide, you also need appropriate platforms to promote and represent your corporation. And when it comes to online sites, a professional, sleek and modern outlook with features to include your services and the important details is a must. But with hundreds of theme collections out there, how would you know which one to go for? Well, fear not, we here at Theme 404 have made sure that we deliver only what is the best for our users. That’s right! Dedicated to delivering only the most quality and standard WordPress themes, we are proud to present our newest addition to our collection. Real Estator Lite: an amazing free WordPress real estate theme! Introducing Real Estator Lite: A Simply Stunning, Feature-rich WordPress real estate theme! Are you tired of going through a countless amount of themes trying to figure out what works best for your website? Do you own a real estate agency, or are you a real estate broker or agent yourself? Looking for something to leave a lasting impression on you and your business on anyone who visits your site? Well, fear not! Introducing our latest and one of the finest free WordPress theme on our collection: Real Estator Lite! With a dedication and eager decision to come up with the solutions for those looking for something amazing, this template is crafted with attention to details. Packed with awesome features, this theme is visually stunning and also quite useful for real estate business niche. One of the key features of this amazing free WordPress real estate theme is that it exclusively includes the One-Click Demo Import option. That’s right! No need to cry over starting entirely fro scratch wasting time and effort. With just a simple click every element you see on the demo can be installed for your use including the media files. All you need to do then is simply adjust and modify it to your preference and you will end with a professional site within a matter of minutes. The major part of any company is their custom logo. For anyone to remember them as an establishment, the option to add their logo to their website is a must. And this is why Real Estator Lite comes with the option that allows the user to easily add the custom logo of their company with ease. 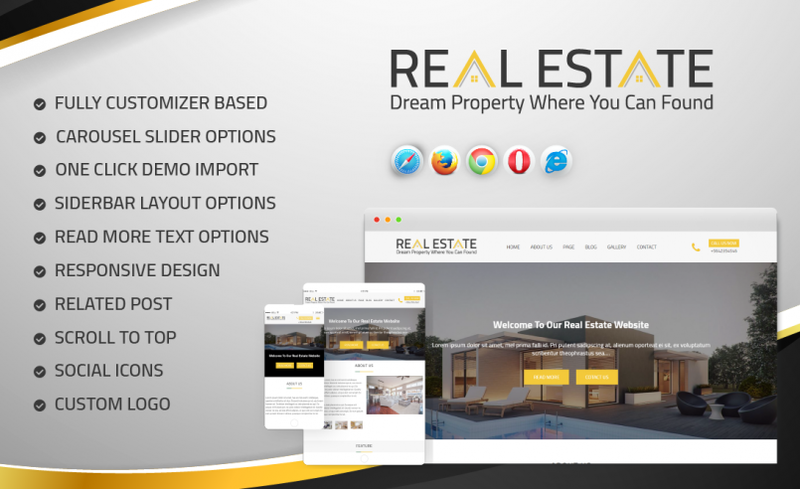 As we have mentioned this before, Real Estator is a professional standard WordPress real estate theme that is fully responsive. This means that no matter which device your users decide to use, your website automatically adjusts to their screen. Additionally the imagery it features also showcases HD visuals. Ensuring that your site looks amazing no matter what, this template is truly one-of-a-kind. Displaying your products and the properties you deal with has never been so easy! That’s right, this awesome WordPress real estate theme also enables the user to easily add media files as a Carousel or Slider. Add attractive and appealing Sliders and Carousels to keep your users engaged and improve the functionality! If you think that is all that this free theme offers, then you couldn’t have been more wrong! There are plenty to fulfil all of your requirements! And if you want, here is a list of features that it offers all the free users! Header and Style Configuration option. Social Icons for easy sharing. Read More text Options for organizing. Custom Background colour or Image. Additional Features with the pro version: Real Estator! If you are impressed with what you get with the free theme, just think about what more can you get with the premium version Real Estator? Although the free version pretty much is awesome in itself, you can get additional features with the Pro version: Real Estator! If you are not a start-up and require more advanced features, here is what is in line for you! Free Contact Page Template at your disposal. Testimonial, Team and Counter Showcase.